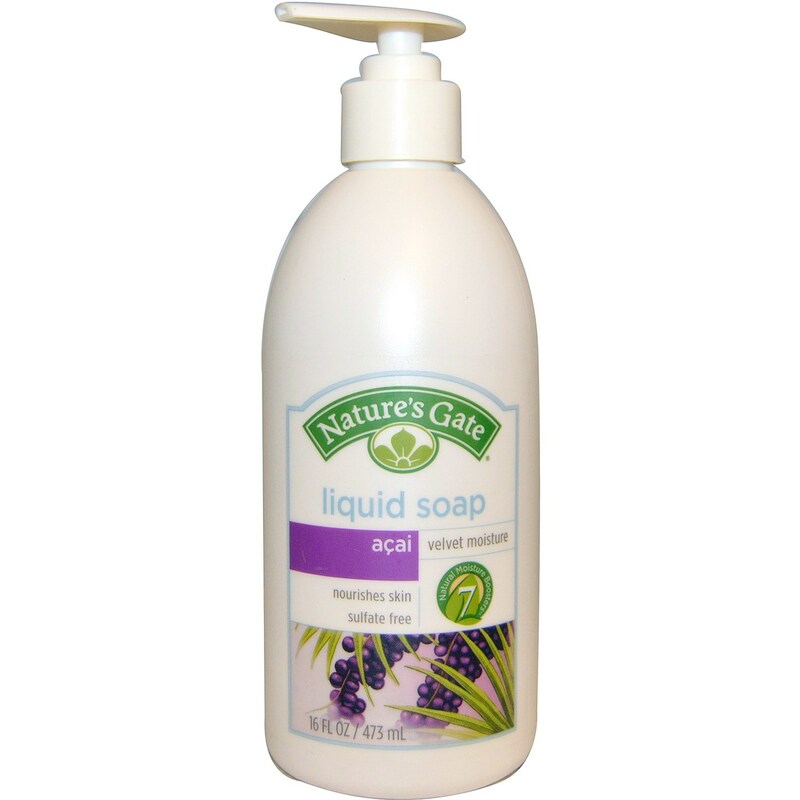 Nature's Gate Velvet Moisture Liquid Soap contains a blend of shea butter, sweet almond oil, apricot kernel oil, soybean oil and more. Advertências: For external use only. Avoid direct contact with eyes. Produced without animal testing. Notas: Paraben Free. Sulfate Free. Phthalate Free. EDTA Free. Synthetic Fragrance Free. Cruelty Free. Vegan. Ingredients: Water, cocamidopropyl hydroxysultaine (coconut derived), sodium cocoyl isethionate (coconut derived), disodium cocoamphodiacetate (coconut derived), lauryl glucoside (vegetable derived), glycerin (vegetable derived), polysorbate 20, euterpe oleracea (acai) fruit extract, euterpe oleracea (acai) fruit oil, sodium lauroyl sarcosinate (vegetable derived), prunus amygdalus dulcis (sweet almond) oil, prunus armeniaca (apricot) kernel oil, glycine soja (soybean) oil, sodium hyaluronate, butyrospermum parkii (shea) butter, bertholletia excelsa (brazil nut) seed oil, myrciaria dubia (camu camu) fruit extract, theobroma grandiflorum (cupuacu) seed butter, hydroxypropyl methylcellulose (plant derived), tocopheryl acetate (vitamin E), glyceryl undecylenate (vegetable derived), sodium hydroxide, phenoxyethanol, citric acid (vegetable derived), fragrance. Recomendações de uso: Pump soap into hands and add water. Lather and rinse. Nature's Gate Avaliações de Clientes.